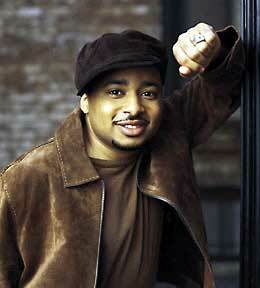 Smokie Norful has been one of popular music's great success stories of 2002. Not to mention 2003 and 2004. And the tidal wave of critical and popular acclaim he has generated with his gold-selling debut album, I Need You Now, and its title song-which has become an almost instant classic-for-the-ages-continues unabated, even as EMI Gospel Music proudly announces the release of Smokie's highly anticipated new release, Nothing Without You. With I Need You Now, currently on top of the Billboard Gospel catalog chart and its follow-up EP, the No.1 Limited Edition, still on the Gospel Top 40 chart, Smokie is more than a success. I Need You Now spent an impressive two years on the magazine's Gospel Top 40 chart, and the single of the same name is still perched in the Top 10 of the recurrent mainstream R&B chart. He has become a true phenomenon. And while Nothing Without You promises to only extend and expand his recognition even further, the ever-gracious, good-natured Smokie sees his meteoric rise to fame from a very humble and down-to-earth perspective. "You can chase after success and recognition all you want," says Smokie, "but the truth is that unless God ordains it, it really doesn't matter. My goal has always just been to see people blessed by the music God gives me, and that's happened beyond anything I ever imagined. It has been a pretty amazing couple of years, but I feel very much at peace. I believe that the same God that did all this on the first go-round can do it on the second go-round as well." Writing or co-writing the majority of the album's 11 songs, and enlisting the production assistance of some of Gospel and R&B's biggest hit-makers-including jazz great, George Duke, Percy Bady, Tommy Sims, and Victor & Cedric Caldwell-Smokie fully delivers on the promise portended by I Need You Now, even surpassing that already landmark work. Still at home musically in what he describes as an "urban/inspirational" pocket, Smokie stretches into some serious, good-time funk and r&b, stirring songs of praise and worship, pop balladry, and down-home blues. But whatever the song, format or genre, his one-of-a-kind vocal prowess-from sweet and silky to edgy and urban-remains pure and unmistakably Smokie. "The church has been and always will be my home base," Smokie says, "not just in terms of supporters, but in where I draw my own strength and spiritual renewal. At the same time, it's important to me to reach out beyond those walls. I don't want to be limited to any one market or niche. I want to try to give something good and of God that crosses lines of race, and age, churched and un-churched, that lots of people can relate to, as well as be empowered and inspired by. I try to bring a very universal approach to what I do." "Can't Nobody" and "Power" are hooky, high-octane, horn-driven proclamations of encouragement drawn from trust in the pervasive power of the Almighty in every facet of His creation. "Worthy" puts a contemporary, melodic spin on rocking, Sunday-morning traditional Gospel, while "I Know the Lord Will Make A Way" delivers the Good News. The showcase ballad, "God Is Able," is an unforgettable anthem and affirmation of faith, eliciting a soul-stirring performance from Smokie that renders it a worthy successor to-and even extension of-"I Need You Now." "That is literally the continuation of the testimony of 'I Need You Now,'" says Smokie. "My wife Carla and I had been told by the doctor that medical complications would prevent us from ever having children, and yet our son, Tre, was born during the sessions for the first album, and was the inspiration for 'I Need You Now.' He was our miracle child. Then a little over a year later, Carla found out she was expecting again, and we had our son Ashton in early 2004, who inspired 'God Is Able.' He was another miracle in our lives." "I Understand" opens with an easy pop/R&B groove, gradually building to a rousing choral Gospel crescendo. "In the Middle" is a God-to-man expression of His abiding presence in the lives of His children that rides atop a gentle acoustic guitar and percussion. The tender and touching "Nothing Without You" was originally written by Smokie in the late '90s upon his and Carla's marriage, and first performed by Smokie at the couple's wedding reception, beautifully expressing the divine love of both a husband for his wife, and a man for his God. "Continuous Grace" is a smooth, soulful expression of gratitude to God. "Healing in His Tears" is both a delicate and dramatic depiction of the ultimate sacrifice of the Savior, while "I Know Too Much About Him" is a strong statement of the certainty of God's truth. "There are a lot of influences and people in this world that try to give us false answers and phony solutions to life situations," Smokie explains. "But once you get to know the Lord, and His Word, the truth becomes revealed, and you know too much about Him to be deceived." Smokie, the son of an African Methodist Episcopal (A.M.E.) minister, grew up surrounded by the best of both Gospel and the sweet soul music of the time, today claiming a wide range of artists from Daryl Coley and Vanessa Bell Armstrong to Donnie Hathaway and Stevie Wonder as important influences in his musical life. As early as the age of two, Smokie had begun to pick out melodies on the piano, and by the time he was four he was playing and singing in his father's church. Smokie spent the first 14 years of his life in Muskogee, Oklahoma, where he performed in A.M.E. churches throughout the area. His recording debut came at the tender age of 10, when he was asked to be a featured artist on a custom album by a regional music director. By the time his family moved to a new church in Pine Bluff, Arkansas, in his mid-teens, Smokie was a musical fixture in the church, and was also developing into a talented young songwriter. Smokie's parents realized and nurtured his musical gifts from an early age, with years of private musical instruction. Choir and musical productions had also been a major part of his high school experience. Nonetheless, Smokie entered the University of Arkansas as a history major, spending the first four years after his graduation as a high school history teacher. Smokie's career path took another turn in 1998 when he felt God calling him into the ministry, and he relocated to suburban Chicago pursuing a Masters of Divinity degree from Garrett Theological Seminary. But his mind and heart had never strayed far from the music that had been born in his bones. Throughout college, he had been the worship leader for the youth department of his local church choir and had assembled and led a 100-voice community choir in Pine Bluff. Upon ordination, Smokie accepted an assistant pastorate at Rock of Ages Baptist Church in Chicago, where he came to the attention of Joanne Brunson, leader of Gospel's famed Thompson Community Choir, who asked him to sing a song on the choir's upcoming album, Real. Smokie agreed, contributing one of his original numbers, and his career as a major-label artist had begun. Since the release of I Need You Now, Smokie has maintained an almost non-stop touring schedule, singing and ministering across America, though he has still made it a priority to keep his role as husband and father first and foremost in his life. As he surveys his life from a platform he once only dreamed of achieving, Smokie's highest goals remained remarkably unaffected by the trappings of fame and the acclaim of man. "One thing that keeps me very balanced and humble," he says with a laugh, "is that when I'm home I'm changing diapers, taking out the trash, and looking after the house. I'm not 'The Smokie Norful, Gospel recording artist.' I'm just 'Daddy,' and 'Honey.' And I wouldn't have it any other way. God has truly blessed us. That's what inspires me, and that, more than anything, is what I want to share in my music." "If anything I ever say, or sing, or do, just gives somebody hope and encouragement that they can make it, and that God is faithful and able, I'll feel like I've accomplished my mission."